The Associated Press has a long story out about Trump fundraisers and business partners Elliott Broidy and George Nader, who reportedly functioned, for a time, as an obscenely high-paid backchannel between crown princes from the UAE and Saudi Arabia and the Trump White House as the countries sought to position U.S. foreign policy against Qatar. 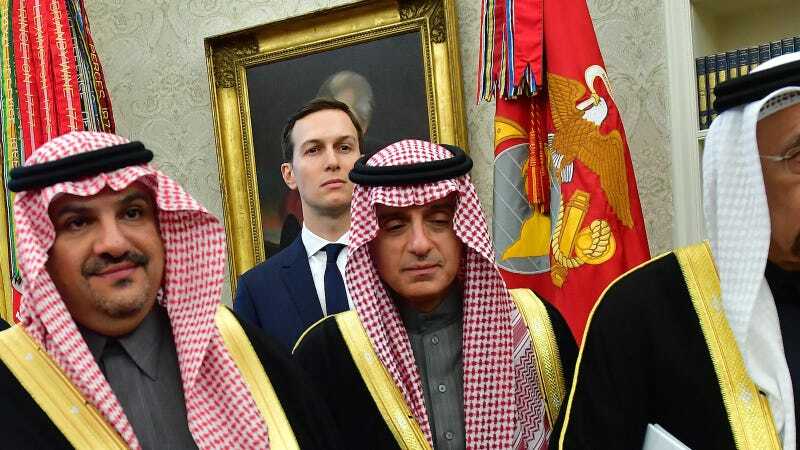 Jared Kushner, aspiring best friend and confidante to said Saudi princes, does not receive a particularly respectful mention. It is unlikely that either Elliott Broidy or George Nader made a particularly positive impression on anyone, themselves, considering their criminal histories (bribery and 10 counts of sexually abusing minors, respectively) and buffoonish incompetence at effectively running their shady operation, as painstakingly chronicled by the AP (Broidy’s lawyer issued a denial). Neither were registered as foreign lobbyists, which is illegal, and Nader was eventually detained by Robert Mueller’s team, although the specific reason for that is unclear. And thus ends another chapter of my upcoming nonfiction tome, Stupid Men Throwing Each Other Under The Bus: An American History.